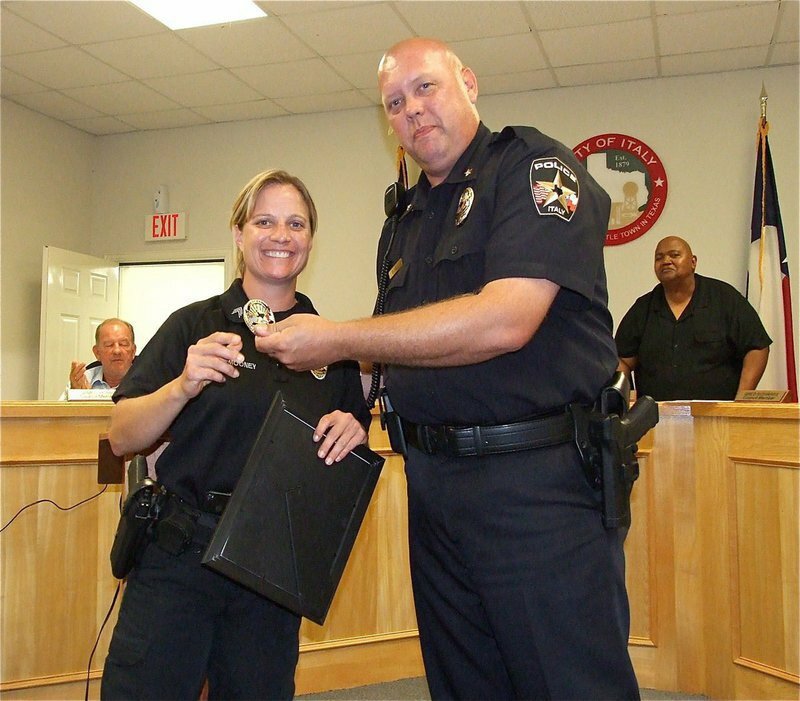 During the City of Italy’s regular city council meeting called to order back on June 11, Italy Police Officer Tierra Mooney was promoted to the rank of Sergeant by Chief Diron Hill. Sergeant Mooney received a Sergeant’s badge and a framed certificate. Once traveling to several other countries to compete in equestrian events, Sergeant Mooney now rides in Italy Police Department patrol vehicles helping to keep criminal offenses reigned in within the City of Italy and parts of Ellis County. Starting her career as a police woman late in life, Sergeant Mooney has been with the Italy Police Department since December of 2008, her first job in law enforcement. To qualify for Sergeant, she had to be a full time officer for no less than 2 years and study from several books from text books to critical thinking books. Also, Sergeant Mooney had to know all of the general orders of the police department and the City of Italy, as well as, know the laws and regulations of Texas penal code and code of criminal procedure. Sergeant Mooney has 52 college credits, completed police academy training and completed K-9 school, as well. Other requirements included, taking the Sergeant’s written test, be vested in this community or be willing to become so and be giving an oral interview. Congratulations to Sergeant Tierra Mooney on her accomplishment!